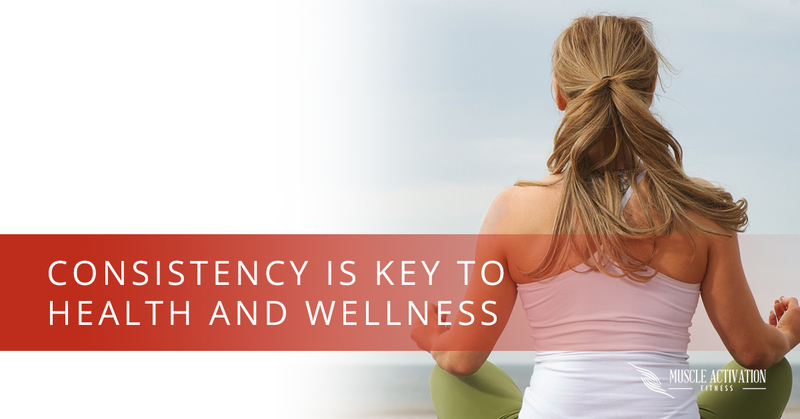 One of the keys to achieving health and wellness goals is consistency. Whether the goals are weight loss, muscle mass building, correcting muscular imbalances, or improved athletic performance, a main component is going to have to be consistently doing the healthy habits week to week, month to month, and year to year. At Muscle Activation Fitness, we have many clients who travel for a living, and so naturally, they have a very hard time exercising and eating healthy consistently. Another group of people who have a hard time with consistency are the hardworking moms out there. With a schedule that is ever changing, finding the time most days of the week can be extremely difficult and frustrating! This article is going to focus on a very short but effective exercise routine to keep the amount of days without exercise at a minimum. The program is going to be pretty simple. The main movements I will want you to focus on are squats/lunges, pushes, and abdominals. I am leaving off pulling movements as they are the most difficult to perform without any exercise tubing or dumbbells. If you are able to find a way to do a pull-up in your environment, please add that exercise into the circuit. would want you to focus slowing down your movements and try to make your glutes be in a tightened state the whole exercise. You can make the goal to be one minute of constant contraction/tightening of your glutes while moving up and down from your squat or lunge. The main push that can be done without a dumbbell or machine is a push-up. If you are a veteran at push-ups, you can see how many push-ups you can possibly do at one time, or just like the squat/lunge exercise before, the goal would be to feel your chest muscles being the overwhelming thing you feel for as long as you can handle! I would prefer you start with the very slow and focused muscle-tightening version. If you are not very good at push-ups or do not think you can do the traditional toes on the ground version, you can modify by putting your knees on the ground and or have your hands on a low table/ottoman to help decrease how much body weight you have to deal with while performing the exercise. Finally, the area we all want to see an improvement: abs! The traditional crunch is one exercise I would like you to try and perform. The thing I see most people do when performing crunches is that they hardly move their chest, but move only with their neck/head. I want the rib cage to be THE moving thing and the head/neck along for the ride. The other option I would like to see done is the reverse crunch. In this exercise, you will need to make sure you have something sturdy/heavy enough to hold on to so your upper body does not move. I want the focus of this exercise to be trying to close the gap between your belly button and the bottom of your torso. On both of these exercises, try the method of constantly feeling your abdominal muscles in a state of contraction and do as many as you can handle. I hope this helps those of you who are frustrated at not being able to reach your goals because your schedule does not allow for consistent gym time. When you need a personal trainer with experience with Muscle Activation Technique, come into Muscle Activation Fitness!